Individuals with androgenetic alopecia (male balding and female pattern hair loss) may lose hair at different sites of the scalp (some front, some crown, some diffusely) but all show a variation in the caliber of hairs when the scalp is examined up close. That feature is known as “anisotrichosis.” This photo shows the scalp of a patient with androgenetic alopecia. Some hairs are thick (well above 60 micrometers) and a known as terminal hairs. The arrow on the right points to one fairly thick 77 micrometer hair. Other hairs on the scalp are thin including many that are showing “miniaturization” or the progressive reduction in calibers. 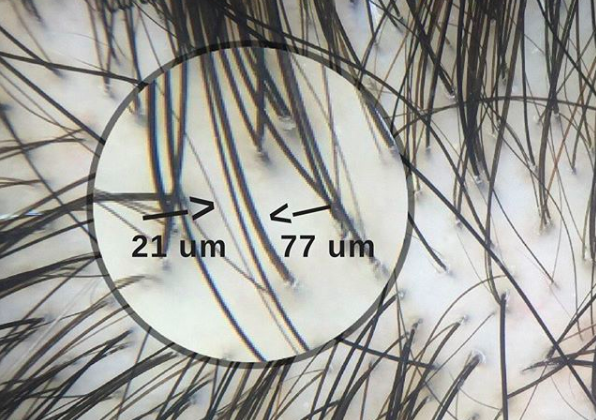 Hairs that are thin, small and less than 30 micrometers are traditionally called “vellus hairs.” One very thin 21 micrometer hair is shown in the photo. The conversion of terminal hairs to vellus hairs is the hallmark of androgenetic alopecia.